What is the risk of a lawsuit cash advance for my client? NONE! 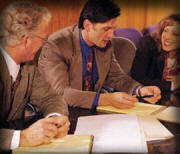 If the client loses the case, the funding source assumes the loss. This is a non-recourse transaction. If the client doesn't receive a settlement they owe NOTHING!